Brady Murphy, who played bass on Christian metalcore act Nodes of Ranvier's 2007 LP 'Defined by Struggle' and was a member of the band until their 2008 split, is lucky to be alive, after losing both arms in an accident that happened back in May. According to South Dakota newspaper the Argus Leader, Murphy, who is 22-years-old, survived an unexpected surge of 7,200 volts while on the job as an electrical lineman, a surge so intense, his hair melted to his scalp and his beard fused to his face. The paper reports that Murphy was working inside a boom-truck bucket, as part of a team working for Highline Construction Company to transfer power lines to newly-installed poles near Onawa, Iowa. Somehow, the crane touched the wires, sending the almost-deadly shock through his body. When workers found Brady, he was slumped on the floor of the bucket, semi-conscious. His hair was gone, and his arms were severely burned. According to his brother, Ben, who was at the scene at the time of the accident, "his arms, they looked charred. And his hands ... all you could see were basically bones. They were just charred up to his wrist, so I was pretty sure he was losing those. But I hoped not much more of his arms after that." 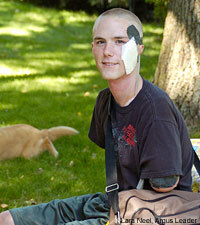 Brady's arms were amputated only inches below each shoulder, and each is connected by plastic tubing, attached to a pump he carries around in a backpack, which circulates fresh blood in and out of the wounded areas to promote the growth of new skin. Brady's head is bandaged and a protective covering attached at the cheek protects skin grafts there. The bassist doesn't remember the accident, and now, is charged with the task of relearning the most basic of human functions. "It's just a miracle that he's even here," Brady's mother, Lori Wendt, told the paper. "Doctors say it was one of the worst burns they've ever seen anyone survive." Brady, it is hoped, will one day be fitted for prosthetic arms and hands, which he'll have to master the control of. So far, the paper claims Brady has had 11 surgeries, with two more on the calendar. He is also expected to undergo several more skin grafts, and is on 17 prescriptions to aid the healing process. The paper reports that he experiences phantom pain is his missing limbs and hands. "It's an excruciating pain in my hands," he said. "I don't know what it is, and they don't really have any cure for it to make it go away. It's odd that I feel like I can raise my arms and wiggle my fingers. If I had to pick one thing, that pain would be the worst thing." Brady, who was about to assemble a new band when his life was changed forever, joined Nodes of Ranvier in 2006, and was with the group until they split soon after the release of their 2007 LP. Guitarist Jon Parker said Brady's situation "is rather tragic, but it's been amazing to see how people have come together to help him with finances and prayers." Nodes of Ranvier were signed to Victory Records at the time they broke up, and had toured with several bigger bands, including Bleeding Through, Every Time I Die, Bury Your Dead, Caliban, Comeback Kid, Norma Jean, Misery Signals, and Extol.